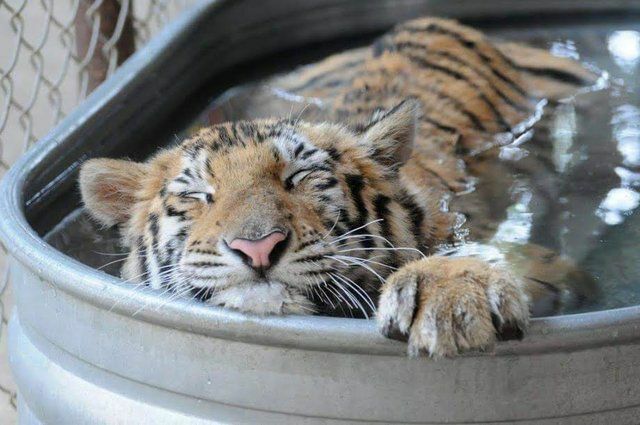 For Aasha, a nine-month-old tiger cub, life as a circus animal had been horrific. She was part of a traveling circus and suffered significant abuse and neglect. 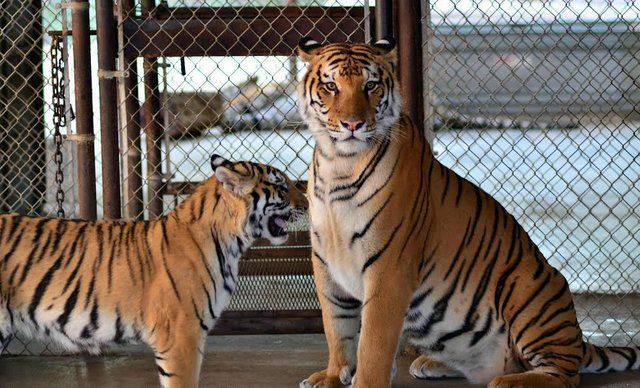 Forced into sharing a cage with a much larger tiger, Aasha was constantly picked on by the older cat. She lived in constant fear. By the time Aasha was removed from the circus by the United States Department of Agriculture, she weighed only 30 pounds — the typical weight for a three-month-old cub. 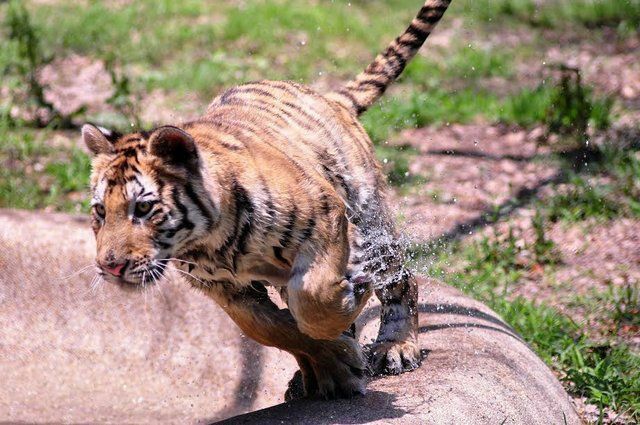 Fearing for Aasha's life, the USDA inspector transferred the cub to In-Sync Exotics Wildlife Rescue and Educational Center in Texas to see if she could be saved. Vicky Keahey, the rescue's founder, was appalled at the cub's condition. 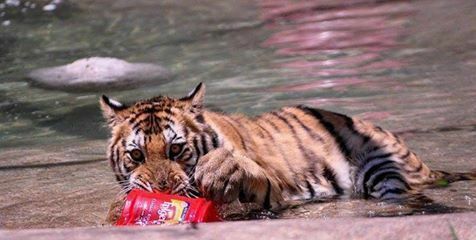 "I asked how could a 9-month-old tiger be that small," Keahey told The Dodo. Keahey agreed to keep Aasha at the rescue, hoping that she could find the source of the cub's pain and discomfort. Thankfully, she found the problem right away: Aasha was suffering from ringworm. "Aasha's bald spots covered almost her entire body and her skin was dry [with] cracked, darken areas and bleeding," Keahey said. The cub also had numerous open wounds, most likely inflicted by the older, larger tiger she was caged with. After a veterinarian had confirmed the ringworm diagnosis, Aasha was placed in isolation at the rescue. "Every day, twice a day, I would go in and give Aasha medications and spend time with her," Keahey said. "I knew I was going to have to handle her in order to get her well." Aside from medication, Aasha also had to take medicated baths — something she wasn't too thrilled about at first. But then, her swimming instincts set in, and she became a swimming pro! Finally, Aasha began to show signs of recovery from the ringworm. "After eight weeks of treatments you could see little bits of fuzz growing back to [what once] bald spots. 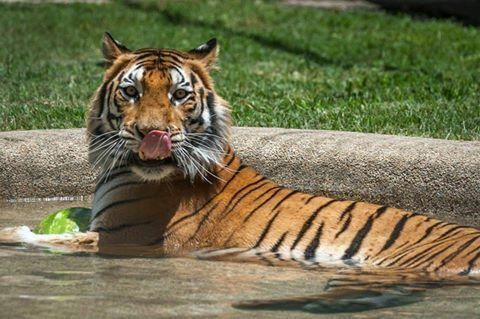 By the time the treatments were over, Aasha loved the water so I put a small tub in [her enclosure] for her to splash in," Keahey explained. Aasha began to get healthier. She put on weight and started to take joy in her life. She loved to play games and enjoyed the water hose in particular! Then it was time for Aasha to interact with her kind again. 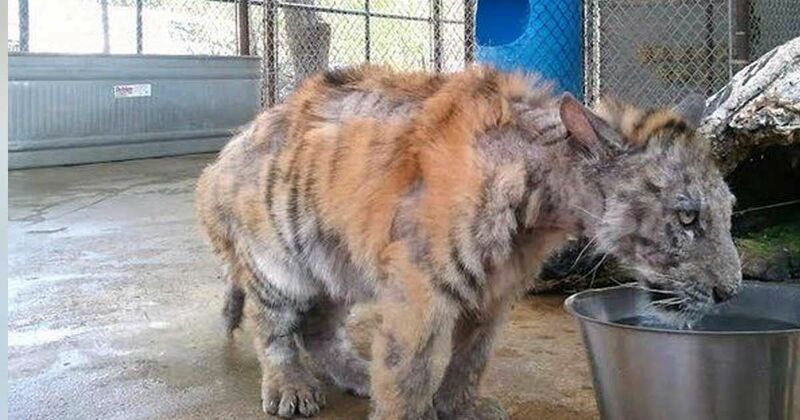 "Within eight months she looked like a real tiger, and it was time to see how she would react to other tigers," said Keahey. She had noticed how one particular tiger, Smuggler, seemed to like Aasha and was always showing off for her. Even though Smuggler was three times Aasha's size, Keahey felt there was a mutual attraction between the two, so she instigated a "dating" process. 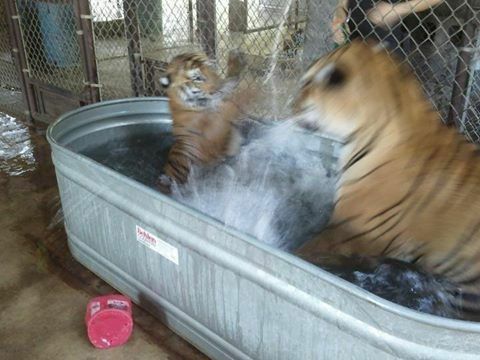 The tigers were introduced slowly through supervised play dates. 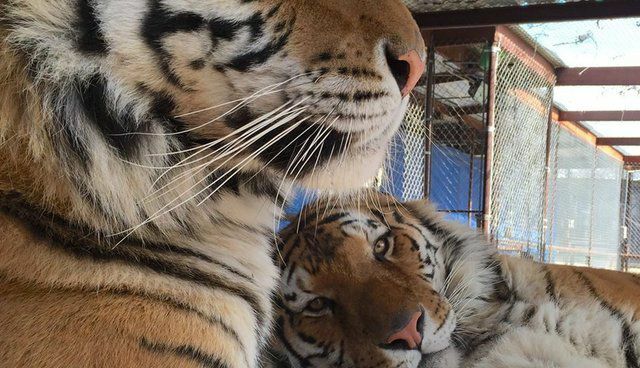 It was a total success, and the two tigers were moved in together. "Aasha is still about half Smuggler's size, but he knows when to steer clear of her," Keahey stated. 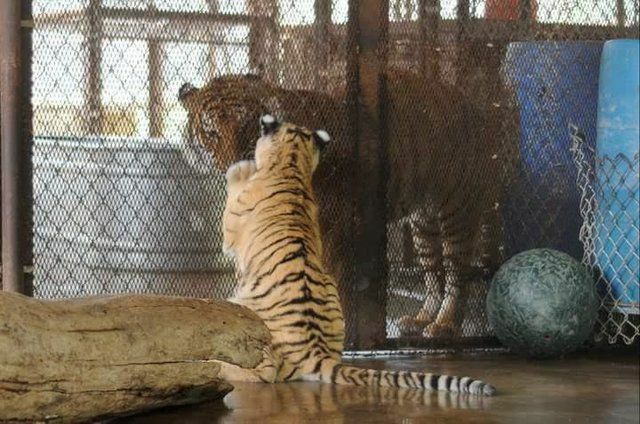 Indeed, four years later, the two tigers are bonded and the best of friends. 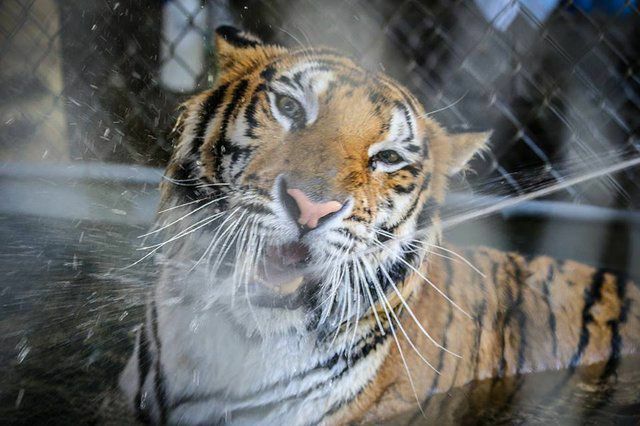 Thanks to Keahey and the In-Sync Exotics Wildlife Rescue and Educational Center, Aasha went from an abused cub to a fully grown tiger who is living in a healthy, appropriate environment. 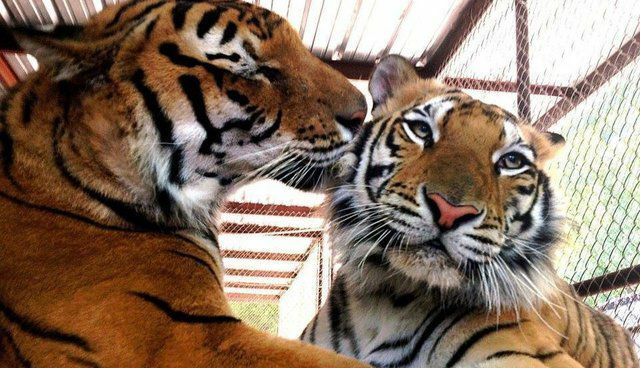 Watch the touching video of one of Aasha and Smuggler's play dates and celebrate the beautiful friendship that has developed between them. Share Aasha's incredible rescue and recovery with your family and friends on Facebook!